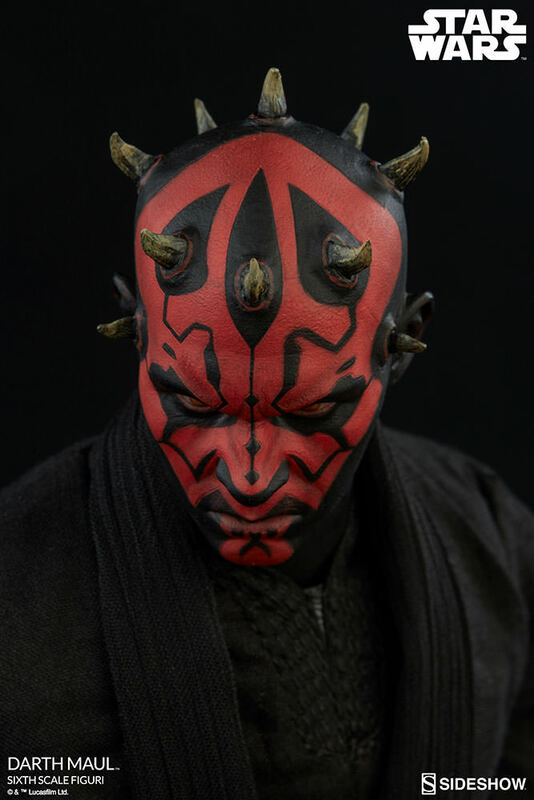 From the moment fans first set eyes on Darth Maul in Star Wars Episode I: The Phantom Menace he became an instant favorite, as his powerful presence and raw intensity left a lasting impression across the galaxy. Starting with a remarkable portrait likeness, Sideshow’s Star Wars collectible Darth Maul 'Duel on Naboo' Sixth Scale Figure captures every detail of the unforgettable villain as portrayed by Ray Park, from his red and black tattooed flesh to his sinister yellow eyes and crown of horns. 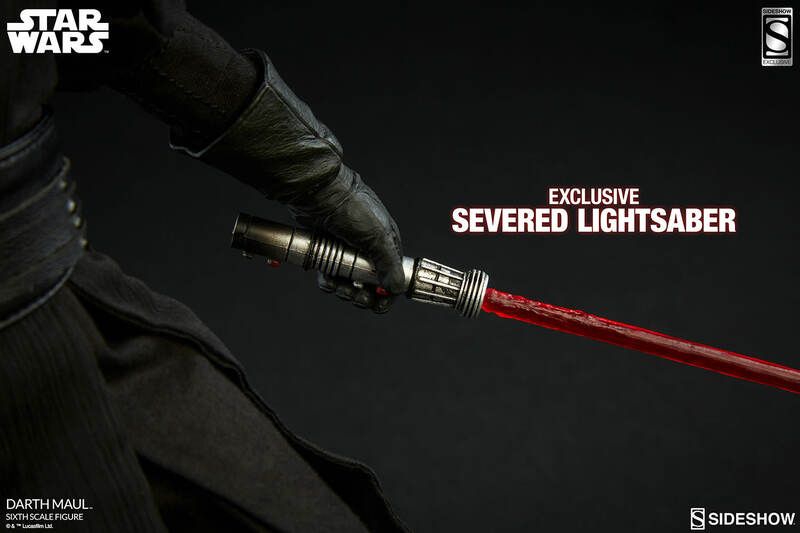 Trained as Darth Sidious' first apprentice, the vicious warrior wields his distinctive double-bladed lightsaber with removable blades, ready to seek revenge on the Jedi in an epic duel on Naboo. 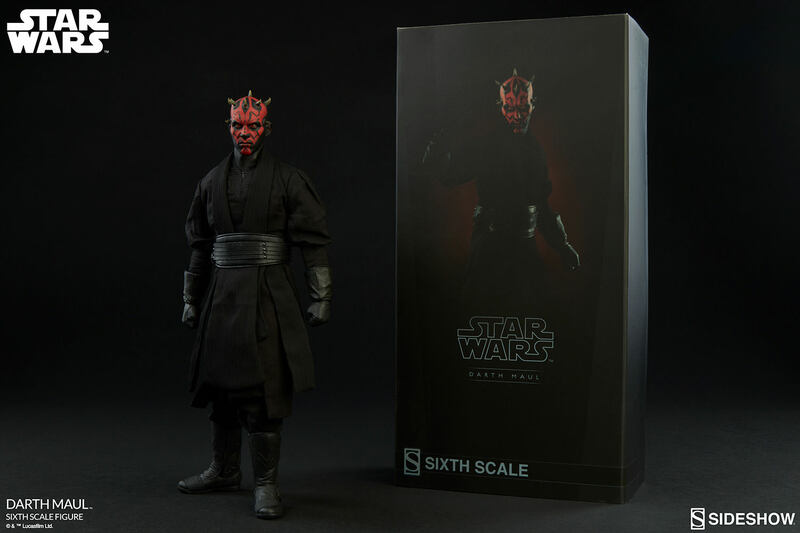 Crafted on a fully articulated body, and decked out in his multi-layered all-black Sith garb, the Darth Maul 'Duel on Naboo' Sixth Scale Figure will make a magnificent addition to any Star Wars collection! 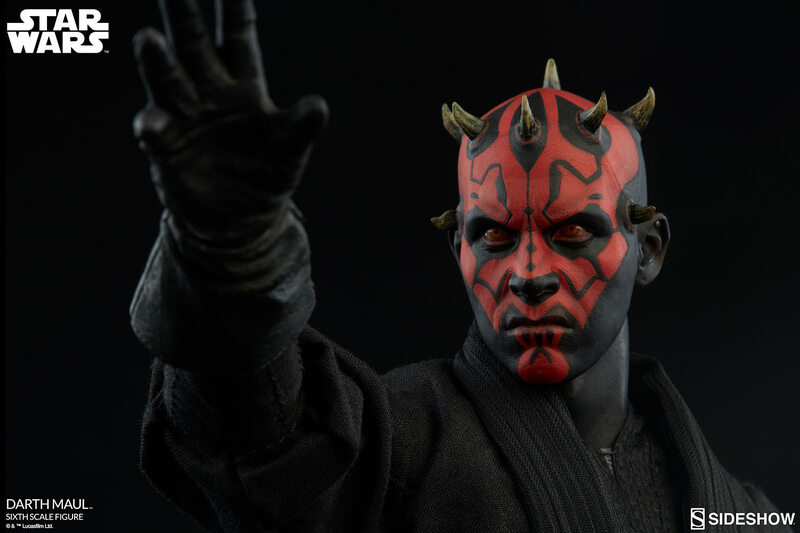 Starting with a remarkable portrait likeness, Sideshow's Star Wars collectible Darth Maul 'Duel on Naboo' Sixth Scale Figure captures every detail of the unforgettable villain as portrayed by Ray Park, from his red and black tattooed flesh, to his sinister yellow eyes and crown of horns. 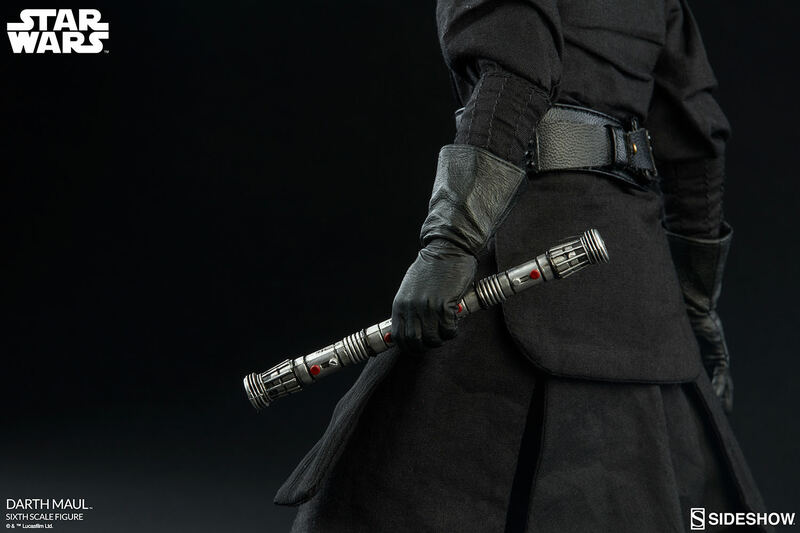 Trained as Darth Sidious' first apprentice, the vicious warrior wields his distinctive double-bladed lightsaber with removable blades, ready to seek revenge on the Jedi in an epic duel on Naboo. 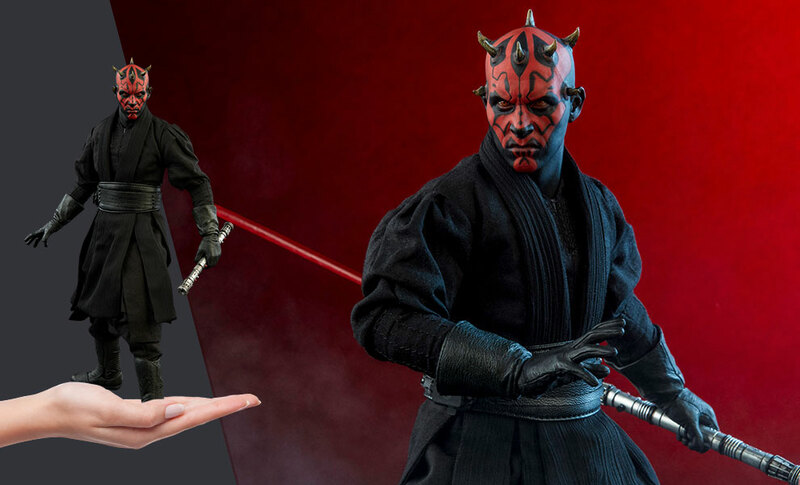 Crafted on a fully articulated body, and decked out in his multi-layered all-black Sith garb, the Darth Maul 'Duel on Naboo' Sixth Scale Figure will make a magnificent addition to any Star Wars collection! Just got it, Work of Art ! Very happy with this figure. Really comes to life in a display case with some accent lighting. Amazing figure. 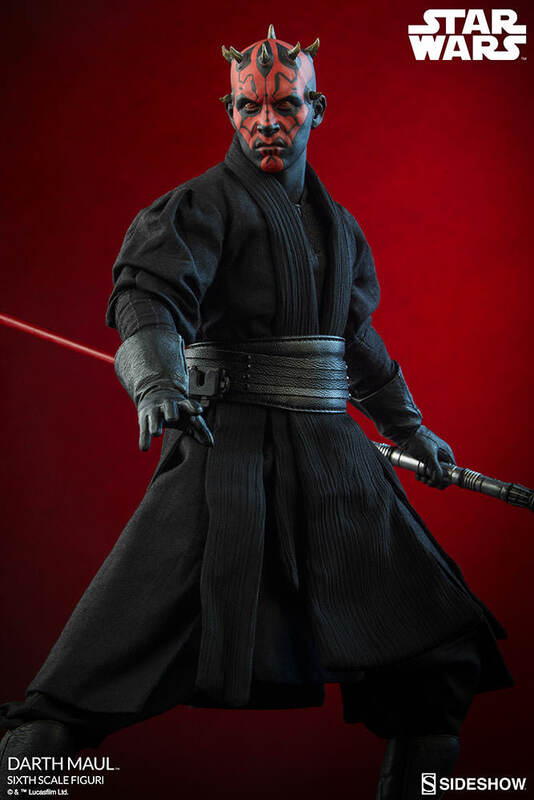 The likeness to Darth Maul is incredible. so, up until yesterday I was a Sideshow Collectibles Sixth Scale Figure Virgin. Embarrassing I know. 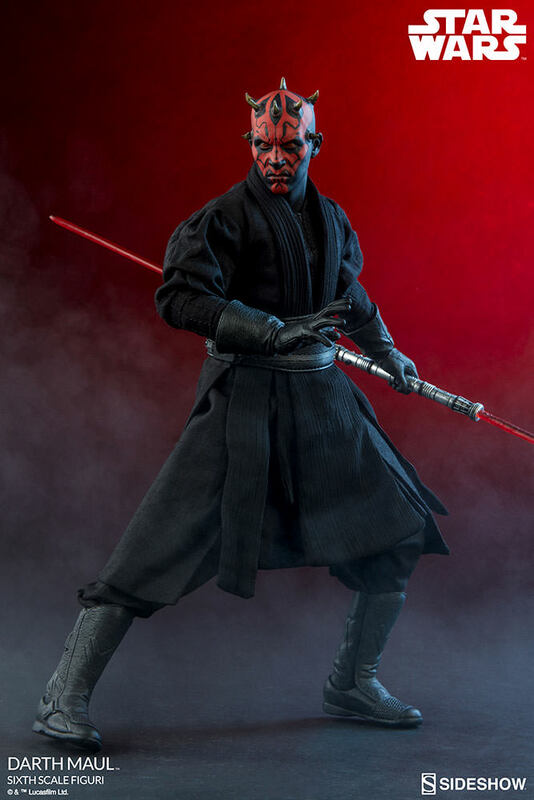 I've been a strict Hot Toys kind of guy and I gotta say, HOLY CRAP! Help me Obi Wan Knobi, the quality on this thing is AMAZING! 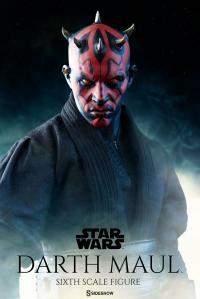 if you are a Star wars fan, you gotta get this guy. He's Scary! 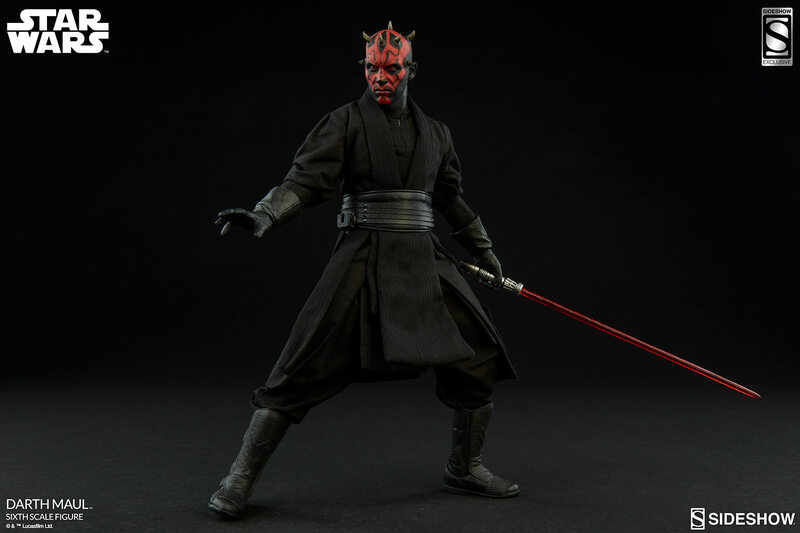 This is my first Sideshow figure and I am very pleased. I was excited and relived to know I was able to get him just before he sold out. Very pleased with the detail and the paint job. This Darth Maul sixth scale figure is absolutely terrific. The paint apps and sculpt are excellent. 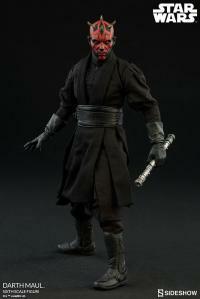 5 stars for this figure and bravo Sideshow!! 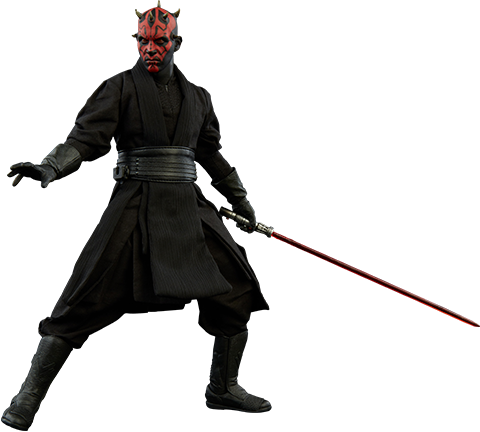 At last we will reveal ourselves._. 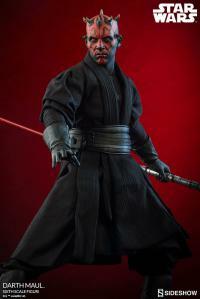 Another hit from sideshow. All I can say is wow.._ The sculpt, the paint app and clothes is just perfect. 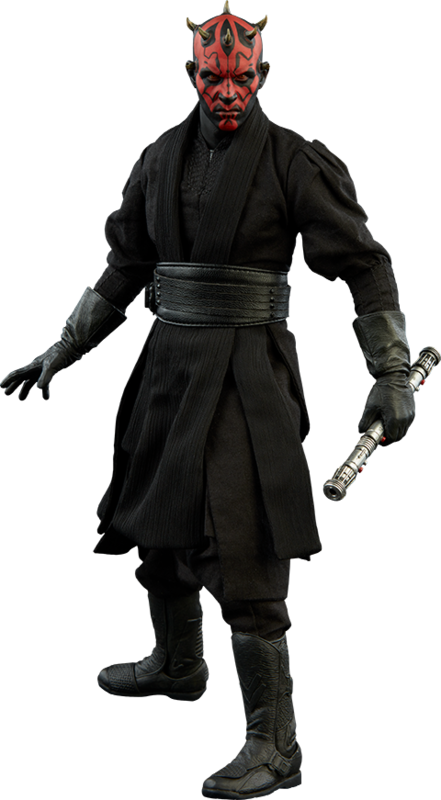 Have him posed next to Jango and Bobba(both in dynamic poses)and he just steals the show. Man that presence! Ich habe diese Figur erst vor kurzem erhalt und ich muss sagen dass sie atemberaubend ist. Die Verarbeitung und die Detaillierung ist einfach genial und ist einfach ausgezeichnet gelungen. 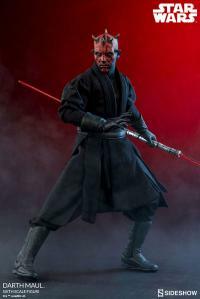 Ich wurde jeden dieses Produkt weiter empfehlen der ein Darth Maul Fan oder Star Wars Fan ist. All I have to say is....WOW. The Maul head sculpt is top notch. 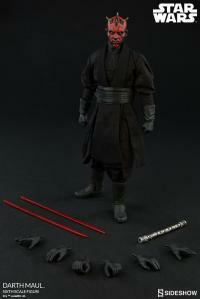 The only tiny gripe I have is I wish he would have come with his cloak; however, this was not a deal breaker. 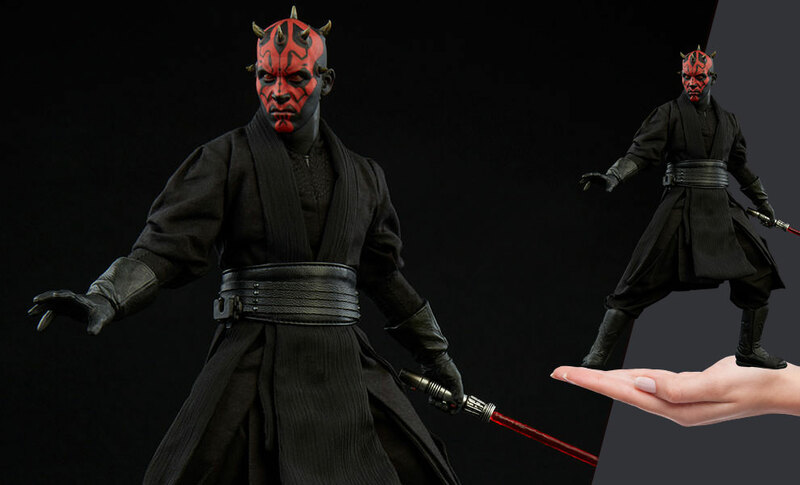 Very good job on this piece Sideshow. 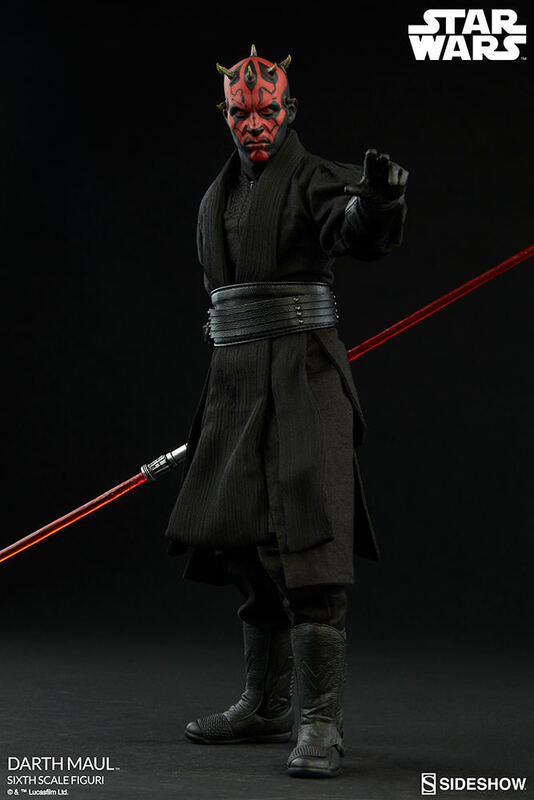 Always wanted this figure when I found out it was coming out and while thinking about getting it, the holidays came up so just other people gifts next thing I knew my wife got it for me for Christmas. An awesome gift great detail looks just like the movie version. The Dark Side of excellence!!! This was by far my most anticipated figure this year. 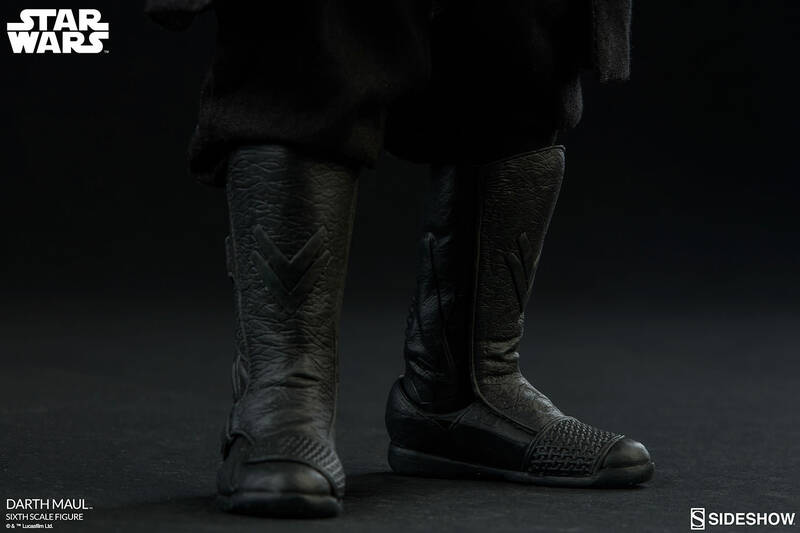 As a fan I must say the detail is unreal and truly a tribute to such an iconic figure. It's in a class all by itself.